The recent Windows 10 version features new icons for your OneDrive locations pinned to the navigation pane of File Explorer. The new icons reflect the synchronization state of the folder along with its on-demand state. If you are not happy to see these extra icons, it is easy to disable them. Always Show Availability Status in File Explorer will permit you to know that the file you want to demand from OneDrive whether exists or not through the Quick access navigation pane. When the item is available in the cloud store you will see the cloud icon tagged with this. The new icons in the navigation pane are connected with OneDrive's Files on-Demand. OneDrive Files On-Demand helps you access all your files in OneDrive without having to download all of them and use storage space on your device. Only files that you mark as "Always keep on this device" have the green circle with the white check mark. These always available files download to your device and take up space, but they’re always there for you even when you’re offline. In the Explorer navigation pane for folders under Quick Access, icons to indicate the status appear as well. Here is how to disable them. 1. Hold down Windows + E shortcut keys to open the File Explorer. 2. 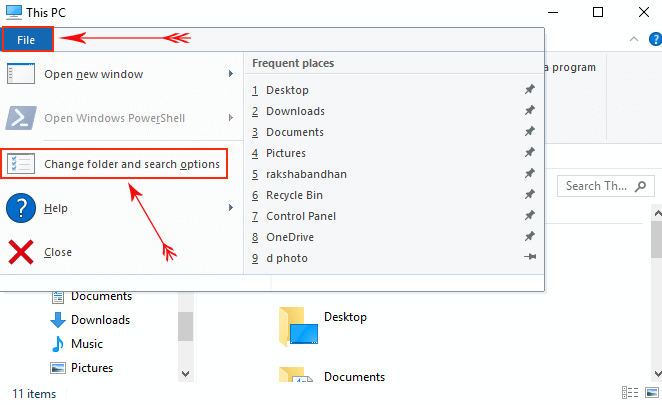 In the Ribbon user interface of Explorer, click File -> Change folder and search options. 3. 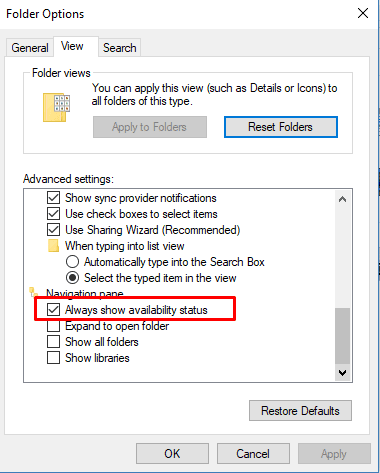 Switch to the View tab in File Explorer options and disable the option Always show availability status under Navigation pane. 4. Click Apply and OK buttons.